Conventional political science depicts legitimate elections as rational affairs in which informed voters select candidates for office according to how their coherently presented aims, ideologies and policies appeal to the self-interest of the electorate. In reality elections, whether in first world democracies, or in the various governmental systems present in Asia, can more realistically be seen as cultural events in which candidates’ campaigns are shaped, consciously or unconsciously, to appeal to the cultural understanding and practices of the electorate. The election campaign period is one in which the masses are mobilized to participate in a range of cultural activities, from flying the party colours in noisy motorcycle parades to attending political rallies for or against, or simply to be entertained by the performances on the political stage, and to gambling on the outcome of the contest. 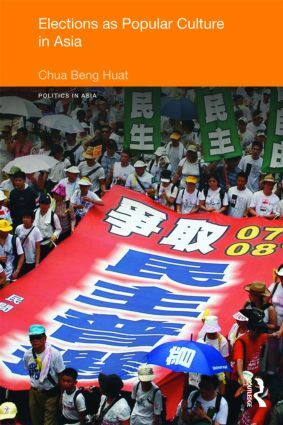 The essays in this book analyse electioneering activities in nine Asian countries in terms of popular cultural practices in each location, ranging from updated traditional cultures to mimicry and caricatures of present day television dramas. In presenting political election as an expression of popular culture this book portrays electoral behaviour as a meaningful cultural practice. As such this book will appeal to student and scholars of political science and cultural studies alike, as well as those with a more general interest in Asian studies.